Yesterday, I made some designs on zazzle with a watercolor that I had done of honey bear talking on the telephone. Each of the nearly 100 products had to be designed individually, because I had to center and fit the design anyway so I ended up playing around with some additions to each design. My granddaughters decided they need cellphone covers that were among the designs with honey bear talking on the phone with a pink background sitting on a purple square. Too funny – they are nearly 6 years old and 3 years old – not quite old enough for a cellphone yet, but don’t tell them that. When I did the doggy tshirt – it looks like Honey Bear is talking on the phone to another honey bear having a long discussion because of where the blocks of color sit – one in pink and one in purple. Too cute – it would be fun for any small girl dog to wear, especially one that loves teddy bears anyway. Some of the other designs incorporated a second honey bear in the design to look like the two are having a phone conversation and at least one of the cellphone covers says, “bearly working” as part of the design which seemed appropriate and funny. With a slight change of elements, this cellphone case has a modern look while still being a teddy bear collectible showing off the honey bear watercolor design. The turn of a purple square to be an angular element against the pink background and having honey bear with his original white background gives a nifty little stage where bear is more obvious. When I made some designs with this same watercolor last year, my focus was on not trusting a bear to stay home without making long distance calls on your phone while you’re not there. I don’t know why it was the thing on my mind at the time to go with the design, but it never occurred to me to add color elements and play with how the design is presented as I did yesterday. When the designs were being created using the zazzle editor and ideas as they happened, I created several different tshirt designs using the pink and purple squares and one or more honey bear figures positioned in different ways to look like he was peering out from or sitting on the squares and talking amongst themselves on the phone while nobody was looking . . . This award gift has the “Bearly Working” Award with Honey Bear and there is at least one cellphone case that says the same thing. It is possible that a tshirt would be pretty good with that saying too. I did some other teddy bear designs and heart designs over the last few days, thinking about Valentines Day and things that would be pretty for that. These heart designs turned out pretty and so when I was designing the honey bear set, I had to try at least a couple that incorporated both the honey bear on the phone watercolor and one of my new hearts designs for Valentines. They turned out nifty but were only used for a couple of the products. I would probably have to go make an entire set using the hearts and honey bear for them to be on other things. Probably won’t do that – it is very time-consuming. Honey Bear makes a cute pink hat for ball games – he’s a pistol alright. The children believe this honey bear is a girl teddy bear – a she bear. I don’t know. It seems right to call him honey bear – but as I said, the girls think of “him” as a her – probably is. Now, that is bear to identify whose luggage it is – can’t miss it. Allows the back side to be customized with name and whatever other information would be handy. I also did a set of products using this one of my gardens paintings which turned out really pretty as this message and note board. I like the pathway through this garden and the way the sunlight hits the leaves in the tree next to the path and the beautiful colors of the flowers in the sunlight’s sparkle. One of these days, I’m going to do an early morning garden painting with the dew on the flowers as the sunlight first glints on them. I love that look in the real world early in the morning while the air is still cool. There is a sparkle to everything and the blue cast of the morning starts to push aside just as the glint of the sun on leaves and flowers is at its strongest. Very pretty. And, some of the heart designs – I didn’t use all of the ones created a few days ago yet. There were about two dozen designs and so far, I’ve only used about five of them on the zazzle store products. They are different and I like them. Daughter says some of them are not viable – too extreme. I may have used neon green in the ones she hated though contrasting against the magenta to make the heart images stand out from the surface more – that was probably what she didn’t like about it, I hope. But these are fun and made some pretty things using them on the various products zazzle lets me make. Then I did a whole set of products which have the dragoness rising from the water computer art that I designed about a year ago – and this time, I added the word Dragoness in a gothic / old english looking font to the products. She is a bit dark though, but I love the way she looks and the structures of the skin around her eyes and nostrils. Maybe on the next design iteration of this dragon, I’ll give her some sparkly laser piercing type of eyes or have her sending out flames through her nostrils rather than calmly rising from the sea . . . how fun. And, then I did a set of things with this photograph of the snow right as the sun was coming up through the trees that I took a couple years ago in Georgia near my parent’s house. Very sparkly. There were some other nifty photos I took that day too which I had forgotten about that might make some really pretty winter themed products – maybe. Just about every day, I’ve been designing products – there were some clouds photographic ones I did a few days ago with the sunlight of the late afternoon on big billowy clouds and the ocean series I’ve been trying to get all put on the store with the different products using those paintings and images I created several years ago. There are some other bear art products done with a different version of honey bear originally created in pastels making him very fluffy looking and some sailboat sailing art that I put on some things. Overall, I like a lot of them – but the ones of Honey Bear Talking on the Phone and the Dragoness ones, I like especially. They turned out really good. By the way, I’m still very frustrated about the disaster that happened with my moving – financially an absolute disaster. But, I’m working on it and maybe things will get easier. I was actually writing the words for this tie when the above misfire happened and gave me a much needed laugh so it became a tshirt design or two – very nifty geek tshirts (and a pun that would likely be funny to only about three people I can think of) – oh well. Its almost like a triple redundancy entendre. That is so wrong.
. . . or a triple entendre with dimensional redundancy. Yeah, that describes it better. Bytes of the Night – how did that happen? I’ll have to make a “dimensional redundancy” tshirt tomorrow for the geeky and nerdy among us to enjoy, too. So, I was designing some new Valentines Day hearts ties and the one above happened, as well as its counterpart with a white background. When I saw the look of the cascade of hearts in such a strange visual effect over the black surface, there seemed to be a thousand places the design could go beyond that. It is easy to see how it would look being worn by someone too, which has been hard to do for many designs. Very interesting though. I like it. Today, we are designing as a team. 5 year old Jasmine and nearly 3 year-old Allia are helping me to design some skateboards and new tshirts on the zazzle cricketdiane store. First extreme skateboard designed today, 12-15-12 with Cricket and Jasmine together doing the design. Very nifty. 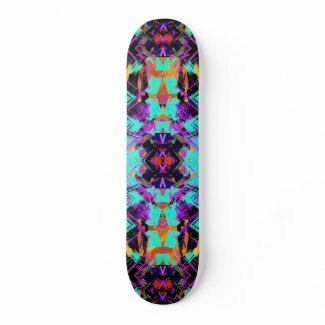 On the second one that Jasmine and I designed, we put one of my ocean paintings on the design in a way that repeats over itself and created this extreme ocean-theme skateboard deck. Amazing. We like it. This created an overall effect as if it is an entirely new painting of the ocean – very surprising. I’ve listed the entire cricketdiane zazzle store catalog of copyrights / the business cricketdiane – for sale by 3-day auction on eBay this evening. And, I suppose – the cricketdiane.com site with its storefront and domain name, as well as the cricketdiane blog – not sure about the blog part – the listing intends the full catalog of copyrights displayed through the online stores. The auction start price is set for $40,000 with a buy it now price of $120,000 and it will only be listed for the next 22 hrs and two days – for 3 days total. I know the value of the copyrights and their potential to be licensed is worth a lot more than that – but I just can’t deal with it anymore. I’m working to move myself from Georgia to New York by the 27th of September and the rest of my belongings, artworks, studio supplies, personal “treasures” and household goods will be sold or I’ll be having to drag them along with me up to New York – which I really can’t afford. Anyway, maybe in the hands of someone who knows business, there could be amazing revenues from these things I’ve designed or rather the designs I’ve created that can be used on a vast array of products. In license to manufacturers, the skateboards could be very reasonably priced to compete in the marketplaces around the world. I haven’t figured out what to do with the other stuff I’ve designed and invented, the research I’ve been working on awhile and information resources that are sitting around my apartment from the last eight years of work as I have lived here. Since I don’t have any way to protect them while getting them into the market – maybe it would be better to dismantle and dispose of them for now. It probably wouldn’t be worth anything in their current form anyway. I’m still thinking about that part. I’ll have to do something with them. As far as I can tell, the last two or three paintings that I’ve done which I’m finishing right now will be standing out next to the trash unless some way to sell them becomes evident fairly quickly. I’m not sure what that will be either. They are really not an eBay thing. And, craigslist is a nightmare for things like that. Maybe someone will see them at the yard / estate / apt sale this weekend or next at my apt and buy them. I guess it would be good to go finish them. Oh, an the number of copyrights on the ebay sale of cricketdiane exceeds 3,000 but they are displayed across more than 19,000 products on zazzle and a number of the earlier designs are on products at cafepress. Since some of them are so unusual, they should have a value for products going forward over the next seven or eight years for product lines, if they are marketed and licensed well. I just haven’t been able to do it partly because I don’t know what I’m doing and partly because I forget that they have to make money for me which is really an art in and of itself. Anyway, wander over and see the offering – email it to anybody you know that could use a business to do – especially one that has a lot of it online already. That part is such an incredible time consuming part of it all and at least that part is done in this to a great extent. There is also a $100 google adsense coupon they sent me that could get that part started, though I don’t know how far $100 goes doing those ads. There has been way too much in all of the business part of this that I just don’t get – from keywords to saying something about the product after designing it and listing it – to monetizing my online sites and blogs – It took me several years to finally get one of the YouTube sites monetized a couple weeks ago – and I still can’t tell if it is actually set up where I would get any of the money from it if there is any. I went in circles trying to understand all that stuff to set it up for hours upon hours – and it never did let me merge the accounts for the various youtube sites I have or get the others monetized with them or whatever else I left undone. It was very confusing. And, all that said – it may be the value of all the copyrights won’t be as much as my used floor easel in the minds of business people. Certainly a possibility I’ve come to accept, although I know that is wrong. There is nothing I can do to change that. Here’s hoping it will find the right buyer.